Find your sand getting low? 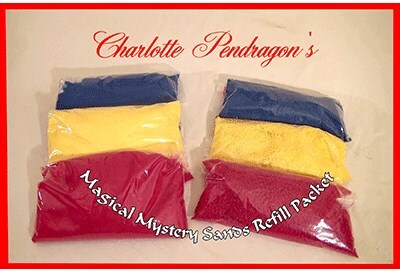 Charlotte Pendragon's Magical Mystery Sands refill packet now is available. This is the same high quality sand sold with the Charlotte Pendragon's Magical Mystery Sand illusion. Charlotte's sand is specially treated therefore the sand stays together and does not 'crumble' when placed in the bowl of water like other sand of lesser quality. The treated sand is made to last so you can use it over and over again without much loss. The colors of sand are vibrant red, blue and yellow so that even those audience members sitting at a distance can see the sand. You will receive over a half pound of treated sand as well as approximately one and a half pounds of the untreated sand. Enough sand to keep your magical mystery sands performing for many, many shows.